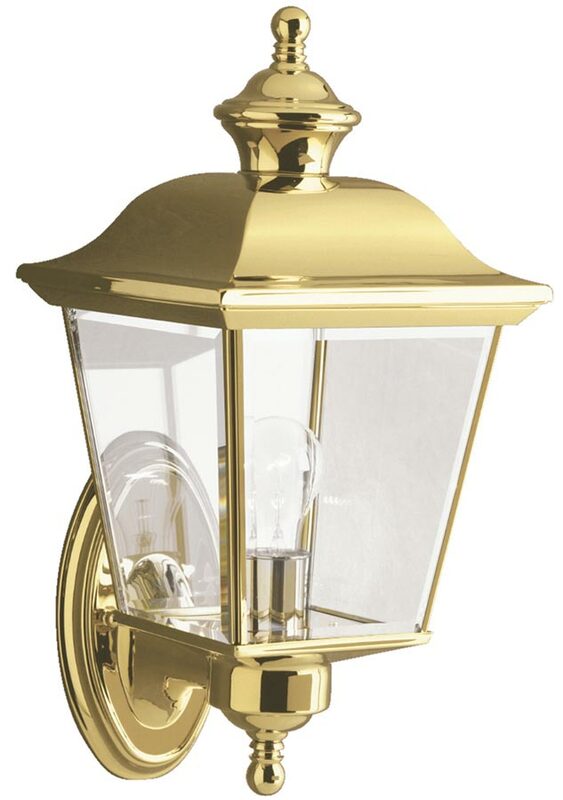 This Kichler Bay Shore 1 light medium outdoor wall lantern in solid polished brass with bevelled glass panels is rated IP44 and features traditional period style. Boasting a cameo wall mount, lower arm, bottom finial and medium upward facing tapered lantern, with sloping curved roof and top finial. The four-sided lantern contains the lamp bulb and features clear bevelled edge glass panels that give a bright all-round light. This collection takes the classic lines of outdoor lanterns and dresses it up in style. The lantern features Kichler’s exclusive LifeBrite polished solid brass, which is guaranteed for a lifetime to look fantastic while being capable of withstanding the harshest elements no matter where you live. Clear bevelled glass panels complete the Bay Shore outdoor lanterns’ timeless profile. If you are searching for quality lighting in a unique style, this medium outdoor wall light should be considered. Fully weatherproof and supplied with a manufacturer’s 5-year anti corrosion warranty, which relates to the corrosion of finishes on exterior lights like this one. There is a matching smaller Bay Shore outdoor wall lantern available; please see below. This period style light is supplied by Elstead Lighting and designed in the USA by Kichler who were founded in 1938. They design beautiful home lighting products featuring award-winning craftsmanship and unparalleled quality, such as the Bay Shore 1 light medium outdoor wall lantern in solid polished brass with bevelled glass panels you see here.